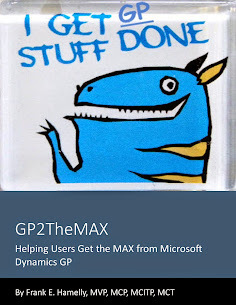 GP2TheMAX - Helping users get the 'MAX' from Dynamics GP: MSDynamicsWorld Decisions Fall 2011 Coming up in 14 Days! MSDynamicsWorld Decisions Fall 2011 Coming up in 14 Days! Don't forget to register for Decisions Fall 2011 to gain new insights into Dynamics GP. Remember, this is one conference that is FREE! Click on the logo below to register and attend this conference from the comfort of your own desk. I'll be participating in the Microsoft Dynamics GP MVP Roundtable with fellow MVPs Mariano Gomez, Mark Polino, and Jivtesh Singh. Join us for a fun and exciting discussion about all the things you always wanted to know about GP but were afraid to ask.